The great economic boom times in American history have come because of fortuitous discoveries. Natural resources (coal first, then oil) fueled vast economic and industrial expansions, which in turn helped create and supply new markets. The last genuine economic game changer was the technology boom of the 1990s, which gave the U.S. a global competitive advantage for a while based on electronics and silicon. 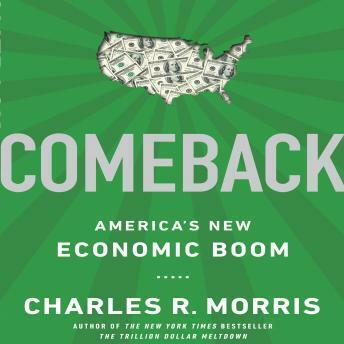 One of the first writers and analysts in the U.S. to predict that the tech boom would lead to a period of sustained economic growth was Charles Morris. In defiance of the recessionary times (in 1990), he saw the coming boom. Now, in 2013, he sees the threshold of another. This time the gift is natural gas. The amount and distribution of gas in American shale is so vast that it has the potential to transform the manufacturing economy, creating jobs across the country, and requiring a new infrastructure that will benefit the nation as a whole. Because of fracking, jobs that once would have been outsourced abroad will return home, America can become a net exporter of energy, and cheap energy will provide the opportunity for innovation and competition. In light of this new opportunity, and other complementary developments Morris explores in this book, the U.S. ought to be approaching the future with a robust self-confidence it has not experienced in a while. But we could fumble it away. The gold-rush style of shale boom companies does not make them good neighbors. A counter-reaction could put their industry, and the new era of national prosperity, at risk. We also have a political system that has the capacity to spoil the benefits of this huge boon. If the wealth locked in the continental shelf is not shared for the general economic good, but is instead exploited in short-term profiteering, then many of the opportunities that exist will be choked off by a few very rich corporations. Managing the great bonus of the vast store of cheap energy is going to become a defining political challenge in the years ahead. At the threshold of a thrilling opportunity, Morris is a brilliantly perceptive guide.